For many years (of course it feels like many for me, as I am still young) I have had a huge passion for cooking. After long discussions and a lot of thinking, I decided that cooking as a career wasn’t for me, but cooking as a hobby is my destiny. I spend my days reading cookbooks, cooking magazines, trying new recipes, and watching FoodNetwork. I am always learning something new that helps me in my everyday cooking. I’ve decided that maybe I should share these tips and tricks and magnificent recipes with you, and hopefully I can help you with your cooking skills. Cooking for me is a release after a good day, and my creative outlet. Never get frustrated when something doesn’t go right, and never be afraid to take ch ances. I’d like to start this first post with something I would like to think that I’m very good at: Chocolate Chip Cookies. I had never ventured into the sweets area because I always had a weird problem that I couldn’t eat what I baked but I could eat what I cooked. As soon as I begun college, I learned that cooking wouldn’t come as easy as it once did. Kitchens weren’t readily available and neither were ingredients, so when I came home I would want to make something, anything! I begun to invest my time into baking. 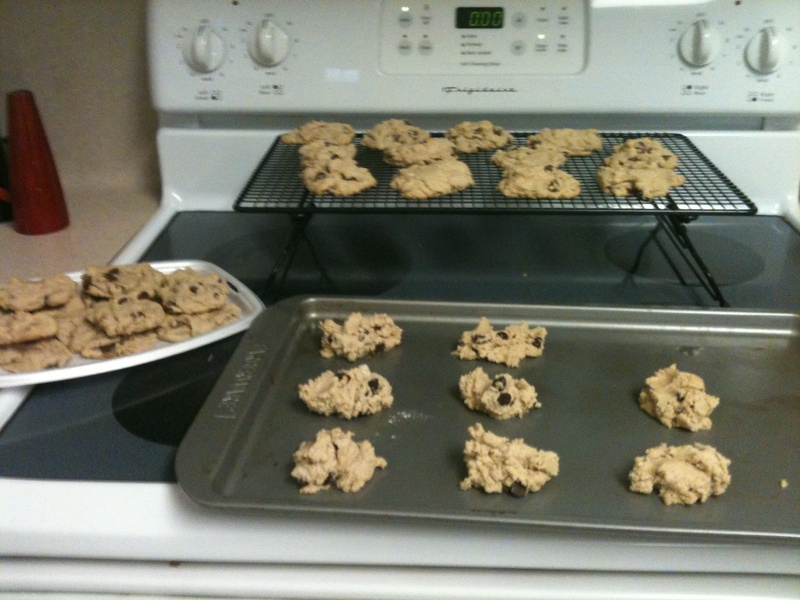 And when I did this I found an amazing recipe for chocolate chip cookies. Tip: When making cookies, they stay the softest when cooled, if you remove them from the pan as soon as they are hard enough to move. This usually means that they are still quite soft on the top. But if they are hard enough to move with a spatula, get them off that pan and onto a cooling rack (and DO NOT skip the cooling rack, it makes a large difference with the outcome of your cookie. AKA the bottom won’t harden). My preferred Chocolate Chip Cookie recipe. Cream together the butter, white sugar, and brown sugar until smooth. Beat in the eggs one at a time, then stir in the vanilla. Dissolve baking soda in hot water. Add to batter along with salt. Stir in flour and chocolate chips. Drop by large spoonfuls onto ungreased pans. LOVE LOVE LOVE!!!! I’m trying this recipe out ASAP!!! Man, since you started blogging, I feel like I should start again too. It’s been months!!! We can be blogging buddies!! And we needs to start talkign about this said Pasta Bar we wanted to do! RETIREMENT PLANS!! !